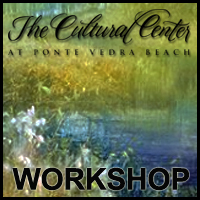 Natural Wonders Workshop May 17, 18, and 19, 2019 The Cultural Center at Ponte Vedra Beach workshop - Call Sara Bas at 904 280 0614 ext 204 or register at www.ccpvb.org/programs/adult/adult-workshops. Demonstrations in watercolor oil, acrylic and mixed media. This is a studio workshop.